Theberton is a sizeable and perhaps slightly suburban village, strung out along the main road to the north of the town of Leiston. 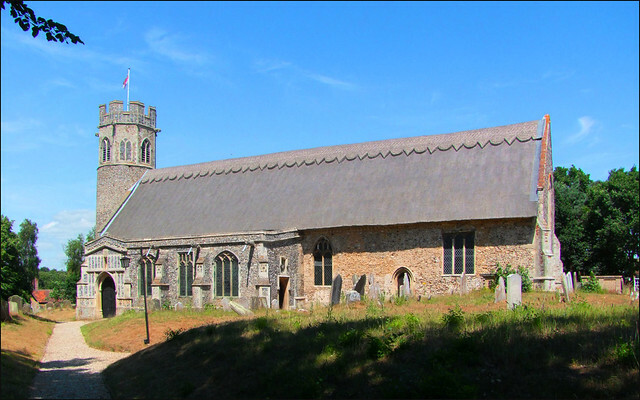 This church has one of Suffolk's prettiest round towers, and loveliest thatched roofs. The gargoyles on the south aisle are particularly characterful. But inside there is a rather grimmer tale. On the night of 17th June 1917, on the edge of this village, German Zeppelin airship L48 was brought down, with the agonising death of 16 of its crew. Finding yourself on fire and falling through the air cannot fill you with much hope of your survival, but remarkably some of the crew did survive, to be rounded up by the local constable, who I like to imagine arriving on his bike. The dead were buried in the graveyard extension here, before being moved to a military cemetery 60 years later; but their memorial remains. In the porch there is part of the superstructure of the giant airship, incongruous in a glass case. The story below it makes fascinating if slightly harrowing reading. Locals still talk about the Theberton airship crash, and many must be the households in the parish which still retain part of the skeleton of the ship. Speaking of skeletons, I was momentary distracted from my exploration of the outside of the church by coming across part of a human armbone in the undergrowth. It had obviously been disturbed by rabbits. It is not unusual to come across human remains in churchyards, for obvious reasons, but rather less usual in the graveyard of a church which is so well-used and cared for as Theberton is. The gargoyles looked on sagely as I examined the bone - as you are now so once was he, they seemed to say. The gargoyles date from the 1846 rebuilding of the south aisle by Sir Charles Doughty. He intended it as a family aisle, and the relatively early date for rural Suffolk explains its pre-eccesiological gothicky feel. The south porch was rebuilt at the same time, but the aisle must have replaced an earlier one, because the arcade which separates it from the rest of the church is 14th Century. However, when you step inside you can see that Doughty's Gothick designer was keen to include them in his work, because they have been painted with extravagant stencilling, along with the aisle roof, as if they had been tattooed. We know that much wood and stonework was painted in medieval times with geometric designs, and some survives in Suffolk at Kedington and Westhorpe. It is interesting to see a 19th century interpretation. The arcade lends the interior a somewhat idiosyncratic feel, as you may imagine, but it does help distract from what is certainly not the best early 20th century glass in Suffolk. The Ward & Hughes memorial window to Charles Hotham Montagu Doughty, who was killed leading a charge in the Dardanelles in 1915, is particularly bad, depicting the portly, balding Doughty as St George, his slayed dragon beside him, kneeling at the foot of what appears to be a plywood cross as the sun comes out. Extraordinary to think that it is contemporary with the fabulous work of Ninian Comper and Christopher Whall elsewhere in Suffolk, both then at the height of their powers. Worth seeing, if only to see how bad the work of the Ward & Hughes workshop got as the 20th Century progressed. And the east window, also by Ward & Hughes, is, I'm afraid, not much better. It depicts the Resurrection, with Christ rising from the tomb above the sleeping soldiers, with angels looking on. Mortlock admired it for its colour and draughtsmanship, but in all honesty Christ looks as if he is knocking on the ceiling with his cross, and possibly shouting "Can you keep the noise down please? We're trying to sleep down here!" As you might expect, the best quality work is in the south aisle. The glass is good, by Thomas Willement, and there is a spectacular memorial to Frederica Doughty, who died in 1843, on the west wall. The date seems incredibly early for such confident, vibrant High Victorian work. Beside it is a simple memorial to the explorer and poet Charles Doughty, author of the 1888 work Travels in Arabia Deserta. As Doughty's biographer on Wikipedia observes, it is written in an extravagant and mannered style, largely based on the King James Bible, but constantly surprising with verbal turns and odd inventiveness. This book was much admired by two remarkable writers, each very different from the other: TE Lawrence wrote a gushing introduction to the republication of 1922, and the author Henry Green wrote an essay about the influence of Doughty's work on him, most obviously in his novel Living. Their joint patronage has helped ensure that Doughty's work has gone in and out of print ever since. Several display cases are devoted to this parish's links with the city of Adelaide in Australia. Colonel William Light, who came from Theberton, surveyed the site for the city, and one of its suburbs is called Thebarton. The vestry door is kept open so you can see the Norman north doorway, and the 15th Century font nearby is similar to those at several neighbouring parishes. But my favourite thing of all is outside the south porch. It is a table tomb against the wall, and commemorates John Fenn, the Laudian Rector here in the early 17th century, who was hounded out as a scandalous minister (that is to say, a theological liberal) by the Puritans. He was lucky to escape with his life; the Rector at Brandeston was found guilty of witchcraft, and hung. Fenn survived the Commonwealth, and died here after the Restoration of the Church of England. The inscription reads: Here is a stone to sitt upon under which lies in hopes to rise to y day of blisse and happinesse honest John Fenn, the sonne of William Fenn, Clarke and late Rector of this parish. Being turned out of this living and sequestered for his loyalty to the late King Charles the First hee departed this life the 22 day of October anno domini 1673. This request for us to rest would have been profoundly disapproved of by his puritan persecutors. Rarely is it so easy to strike back at religious fundamentalism, but here one can do so simply by sitting down! So I did.